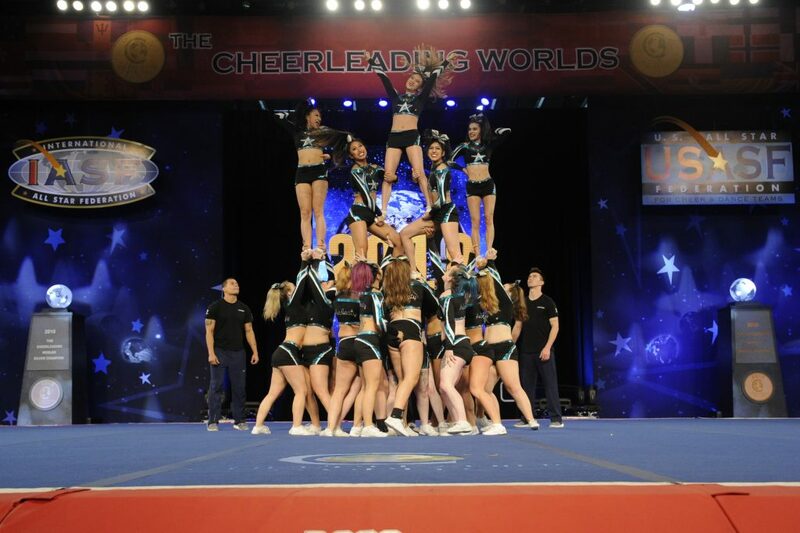 Adrenaline All Stars is a successful cheerleading program located at Wayland Sports in both Surrey and Richmond, B.C. 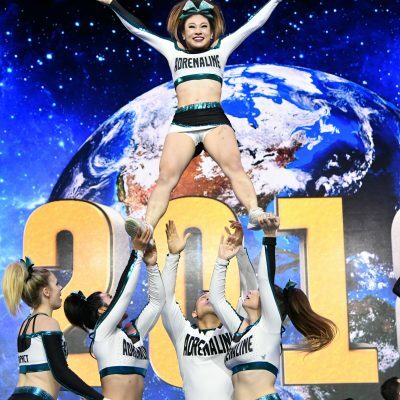 Our gym offers both recreational and competitive cheerleading at various levels, and fields an International All Girl Open Level 6 team with multiple appearances at the World Cheerleading Championships. Adrenaline is committed to helping each athlete reach his or her full potential, and we are proud of our well-rounded approach to training. Our staff consider each aspect of the physical, mental and emotional athlete to be important, and strive to cultivate strength in all areas. The goal as a program is to develop confident, motivated young men and women, who are passionate not only about the sport of cheerleading, but also values of teamwork, accountability and dedication. Adrenaline All Stars is capturing local, national and international placings in the world of competitive cheer. Select teams also receive an opportunity to travel, perform at community events, and train under reknowned professionals Lisa Aucoin and Kenny Feeley from Spring Cheer Dance & Tumbling. The BC Cheerleading Association (BCCA) follows the USASF Rules. Events typically implement the Varsity Scoring System. Please use the links above for detailed information on local events, divisions, safety rules and scoring rubrics. 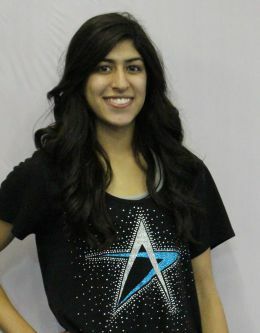 Simran previously cheered for 6 years and this is her 3rd year as the Cheer Director at Adrenaline. 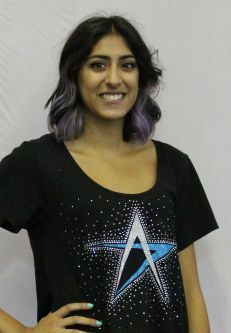 Before starting cheer, Simran was a gymnast at Cartwheels (now Wayland) for 6 years. She is currently completing the BBA: Human Resource Management program at KPU. Her two favourite competitions she has competed are: Worlds in Orlando (2015) and NCA Nationals in Dallas (2014). She is USASF Level 3 certified, and has her NCCP Level 1 Gymnastics, NCCP Level 1 Trampoline, Athletic Taping and First Aid & CPR-C certifications. Shannon comes with nine years of cheer experience and this is her fourth year at Adrenaline. 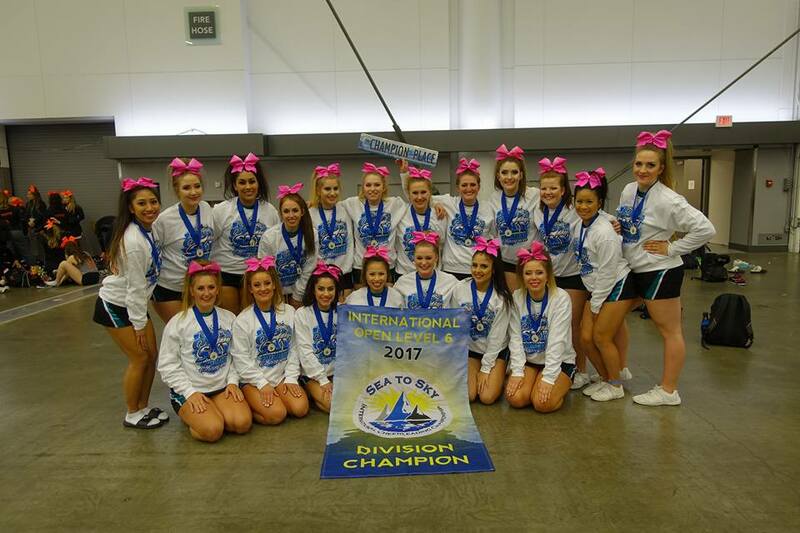 She previously coached the competitive program at Thompson Rivers University for 5 years and is happy to be able to continue both coaching and cheering in the lower mainland. She is currently an Events Specialist at Kwantlen Polytechnic University and is certified with USASF Building Skills Level 3 and Tumbling Level 2 in addition to holding Occupational First Aid Level 2. Shannon will be coaching Junior 1 Crossfire this season. Did you know? Shannon’s high school competitive dance team was also called Adrenaline! Briana has cheered for a total of 4 years and this is her first-year coaching at Adrenaline. Briana previously coached the Seaquam secondary cheerleading team for 5 years and is excited about this new transition to All Star cheer. Briana has cheered for our Open 6 Audacity for the last 2 years. Before starting cheer, she was a gymnast at Cartwheels (now Wayland Sports) for 5 years. She is attending UFV in the Bachelor of Kinesiology program which she will graduate from in April. 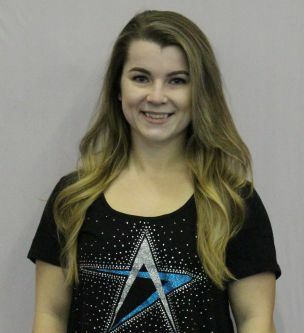 Briana is USASF level 2 certified, NCCP level 2 certified and currently holds Standard First Aid & CPR-C.
Briana will be coaching our Senior 2 Shockwave this season. Did you know? Briana’s favorite part of cheerleading is tumbling and her favorite competition was the world championships in 2017! 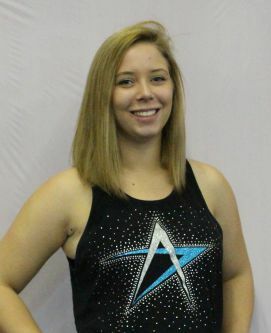 Kourtney is entering her 6th season as a coach and her 9th season as an athlete at Adrenaline! She holds USASF and BCCA level 3 credentials as well as First Aid, CPR-C, and concussion training. She’s also NCCP foundations trained. Her goal is to either become a human rights lawyer or have a career in social work! She loves cheer and Adrenaline with all her heart and can’t wait to see what this season holds! Kourtney will be coaching Mini 1 Mighty Mites & Senior 2 Shockwave this season! Did you know? Kourtney has pirate in her blood! She is distantly related to Captain Kidd! Paige previously cheered for 6 seasons and this is her 7th year of coaching at Adrenaline. She attended the 2015 World Cheerleading Championships with Audacity. She is currently in SFU’s teaching program and hopes to soon become an Elementary School Teacher. 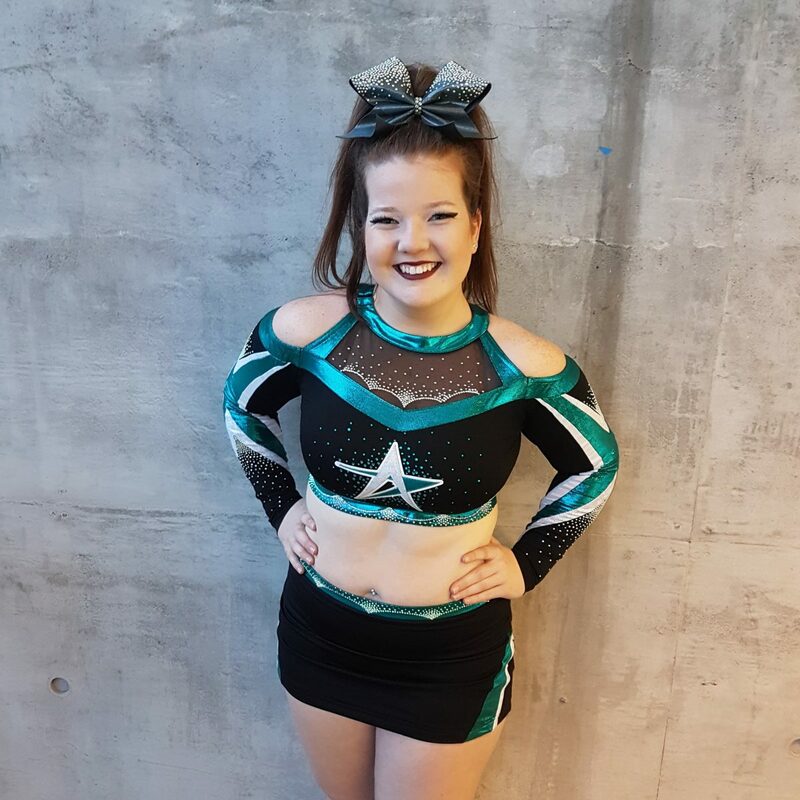 Paige is USASF Level 3 certified and has her NCCP Level 1 Gymnastics, NCCP Level 1 Trampoline, Athletic Taping and First Aid & CPR-C certifications. Did you know? Paige’s favourite part of cheer has always been tumbling and she loves anything chocolate! Keara grew up doing gymnastics before making the switch to cheerleading. Since then, she has been coaching both sports for almost 15 years! She has been with Cartwheels/Wayland Sports since 2009 and was the previous program director for Adrenaline. Keara graduated from UBC with a degree in Kinesiology & Health Science, and has been a member of the BC Associastion of Kinesiologists since 2015. She now works for a provincial sport organization. She holds USASF Level 6 certification as well as NCCP Level WAG and Trampoline, Standard First Aid and CPR-C, as well as Sport First Aid & Athletic Taping certifications. 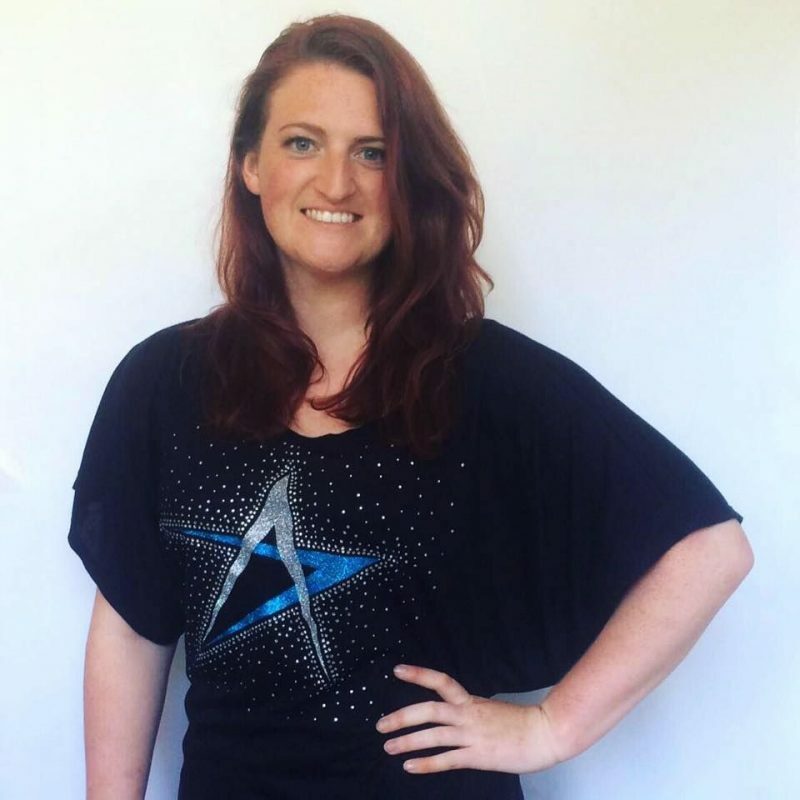 This season Keara will be coaching both our Level 4 & Level 6. Did you know? Keara has two rescue dogs who she loves to go hiking with! While we do not hold official tryouts in the fall, select competitive teams may still have available positions, and interested athletes are evaluated on an individual basis. 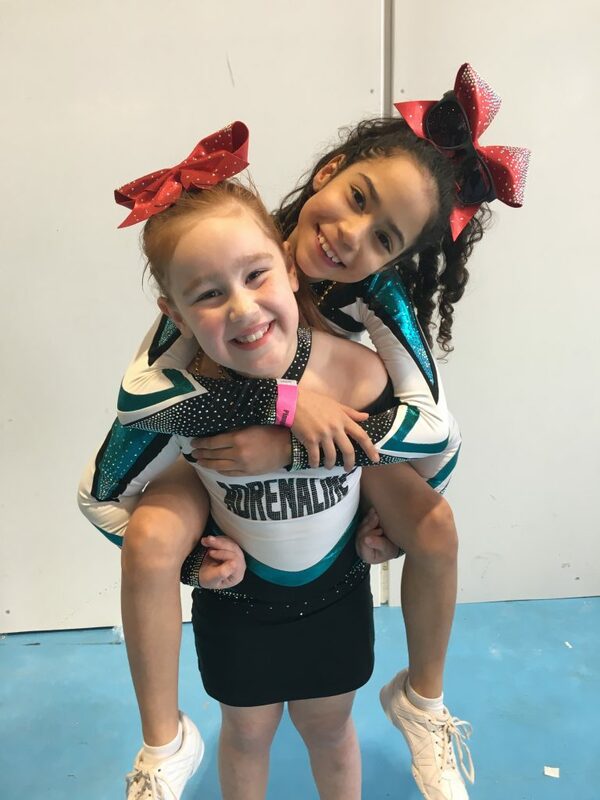 Families interested in joining the ongoing Recreational Cheer program are encouraged to contact our Cheer Director (cheer@waylandsports.com), or the Wayland Sports gym office (604.594.1555) to arrange an free trial class. 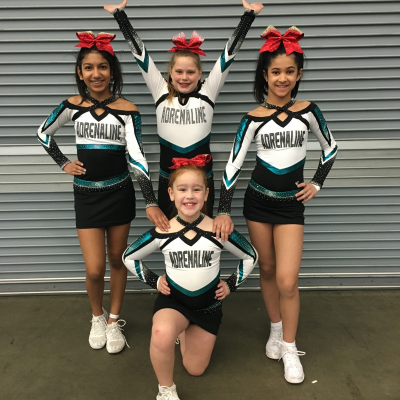 Mini Level 1 is our introduction to competitive cheerleading for those 8 and under. Athletes learn and perfect the basics of competitive cheer and compete at multiple local competitions and one international competition throughout the season. Focus is on building skills such as stunt technique, tumbling skills (rolls, cartwheels, handstands, walkovers), jumps and overall body awareness and confidence with performing. 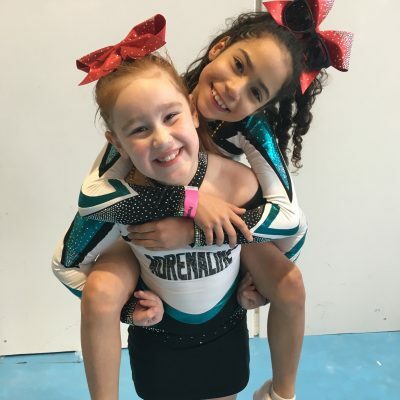 Junior Level 1 is both an introduction to competitive cheerleading for those 8 and older and an opportunity for returning athletes to perfect Level 1 technique and skills. Athletes learn the basics of competitive cheer and compete at multiple local competitions and one international competition throughout the season. Focus is on building skills such as stunt technique, tumbling skills (rolls, cartwheels, handstands, walkovers), jumps and overall body awareness and confidence with performing. Sundays 6:15 p.m – 7.00 p.m. (Mandatory Tumbling) AND 7:00 p.m. – 9:00 p.m.
Wednesdays 7 p.m. – 9 p.m.
Senior 2 is one of our elite competitive teams for those who are 11-18 years old. Athletes should already have the basics of Level 1 competitive cheer and the focus is on building higher level skills such as back handsprings and extended stunts. This team competes at multiple local competitions and at least one international competition in the US. Sundays 12:45 p.m. – 3:15 p.m.
Tuesdays 8:15 p.m. – 10:00 p.m.
Open All Girl 6 competes at the highest level of cheerleading with the goal of earning a bid to attend the World Cheerleading Championships. Athletes must have good stunt technique through previous levels and have or be working towards high level tumbling. Audacity has competed at the World Championships in 2015, 2017, and 2018. Recreational cheerleading is essentially an introduction to all star cheerleading. All star cheerleading differs from sideline cheerleading in that the focus is on creating a routine with tumbling, stunts, jumps and dance for performances or competitions – routines do not include chants, signs, or poms. Your athlete can join this team for fun and as an introduction to cheer. Contact cheer@waylandsports.com for your free trial class today! Athletes may join at any point during the session. During their time in prep cheer, they will learn all the fundamentals of cheer which includes: stunting, tumbling, jumping and dancing. They will be working towards create a short routine which they will perform at the end of their final class. Not only will they learn new skills, but they will learn about team work, self-discipline and how strong work ethic will help you achieve personal goals. Sundays 3:45 p.m. – 5:15 p.m.
Email Simran at cheer@waylandsports.com for your free trial class today! 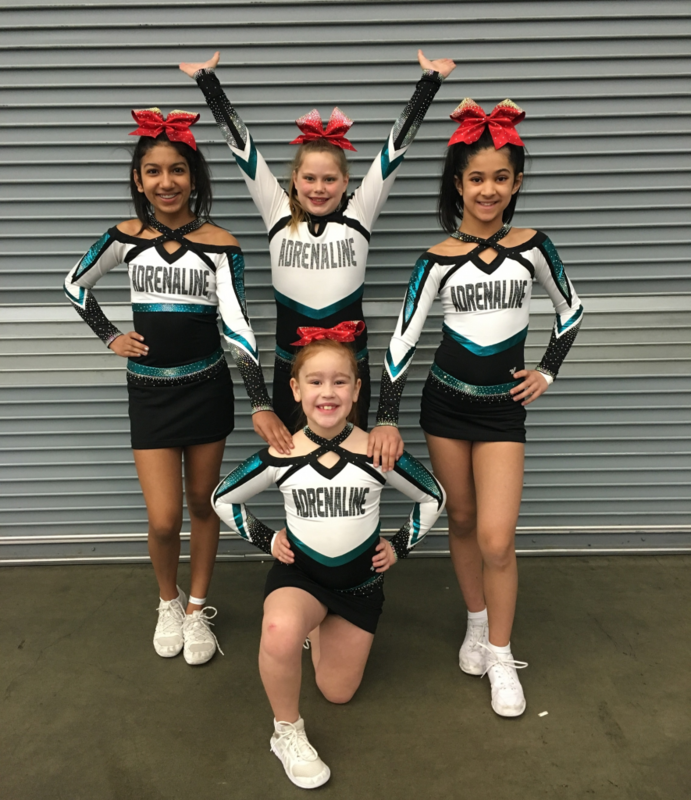 The Adrenaline All Stars Booster Club is a parent run non-profit that fundraises to offset costs for expenses related to travel competitions, team gear and more! Email cheer@waylandsports.com to be added to the Booster Club mailing list. Get your tickets from any Level 1 or 2 parent at Adrenaline! Join us for dinner, 50/50, raffles, a silent auction, a toonie toss, dice games and pin head! There’s many prizes to be won! Is your athlete close to achieving a skill? Wanting to excel faster or improve on their technique prior to team placements? We have 30-minute cheer specific private tumbling or partner stunting privates available with our staff available throughout the season! Email Simran at cheer@waylandsports.com or call 604-594-1555 to register your athlete today! Please refer to your athlete handbook for competition dates and locations. Events schedules are typically released 1-2 weeks in advance of the event. Q: What is Adrenaline All Stars? 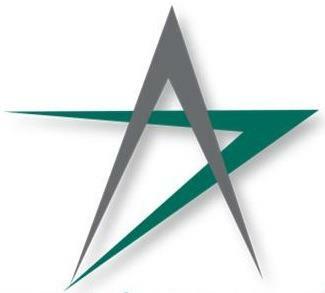 A: We are a competitive cheerleading program, also known as an all star cheerleading program. We guide each athlete to live up to his or her full potential, while teaching the invaluable skills necessary to succeed on a team working towards a common goal. Our goal is to support the development of well-rounded individuals, who excel both in and outside of our gym. A strong emphasis is placed on skill technique and developmental progressions; each athlete is taught the importance of execution and strong foundations in all aspects of competitive cheerleading which includes tumbling, stunts, jumps, and dance. Q: What is All Star Cheerleading? A: All star cheerleading is a highly competitive sport and one of the fastest growing in Canada. We do not cheer for other sports teams. Athletes perform a 2:30 min routine that is composed of jumps, tumbling, stunts, pyramid, and a dance. This routine is performed and scored against other competitive teams at various local, national, and worldwide competitions. Tumbling is when athletes perform moves such as: cartwheels, round offs, back handsprings etc. Stunts are when a group is lifting or tosses a person in the air. Pyramids are a form of stunts, where stunts are performed as a large group and interconnected. Q: What are the age requirements, divisions and levels? A: There are many different combinations of age groups and levels. So many sometimes that they can be quite confusing! This system was created to ensure that like ages were competing with like skill sets. Levels were designed to make sure that each team competes and is judged by how well they demonstrate a standard set of skills expected for every team competing at that same level. The levels range from 1-6 with level 6 being the highest and most difficult. Q: How do you place athletes onto their teams? A: Our coaches take the time to put together teams where they feel each individual will work well with others on that team in order to create a successful routine. Our general rule is to place an athlete on their age appropriate team first, and then we invite them up to a higher-level team where they are asked to crossover. A crossover is when an athlete competes with more than one team. Exceptions can be made to this rule and is a case-by-case basis. It depends on what skill set an athlete has and where spots on teams need to be filled. Q: If I don’t tumble can I still join cheer? A: Most of our athletes began with little to no tumbling. Our staff works hard to ensure that all athletes meet their personal tumbling goals. These goals can be achieved if an athlete works hard, takes private lessons or enrolls in a tumbling class and keeps pushing themselves to achieve their goal. Q: Where are competitions held? A: Cheer competitions are held all over Canada and the US. Our teams primarily compete in British Columbia with some teams competing in the US. The competitions can be 1 or 2 day events. One-day events are smaller and local, while 2-day events are larger national competitions. Q: My child really wants to do Cheer. How do they get started? A: The best way to get introduced to cheerleading is to put your child in our Recreational Program “Cheer Stars”. This class runs for a 14-week session (the same as our recreational gymnastics. They train once a week for 1.5 hours. This way, you will know that your child is enjoying the sport and will not change their mind after expenses and commitments have already been made.